We are a small mom and pop shop that works hands-on to craft all of these tables, mantels, and countertops. We feel so very fortunate to reclaim old wood from the fading American landscape and to create wonderful pieces that can last generations. It is indeed a blessing. Let us us create something for you. 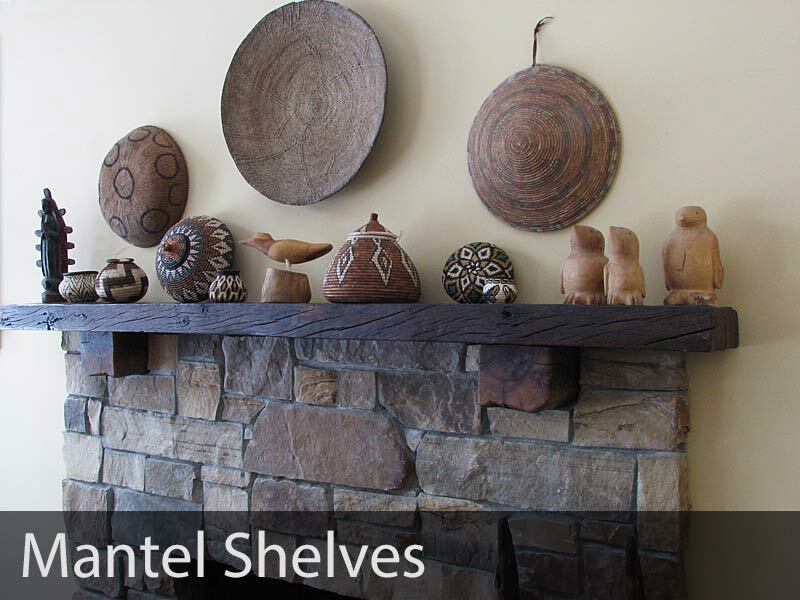 These beam mantels are the real thing – many with ax marks from American settlers in the 1800s. There’s no “distressing” in our shop; it’s all original. We sand and finish to make each beam a thing of beauty. We also work with some great blacksmiths for iron accents. 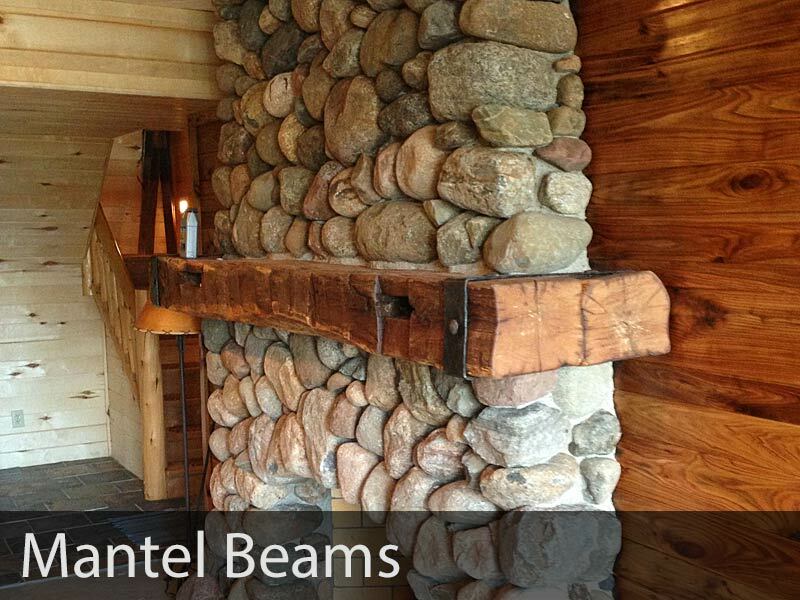 Most beams that come from old barns are square-shaped like 8x8s, 9x9s, and so forth. On occasion, we find rectangular material like 6x9s. This is usually log cabin timbers that have tree-like fronts with hand hewn tops and bottoms. We also cut large 10×10 hand hewn beams down to 5x10s. 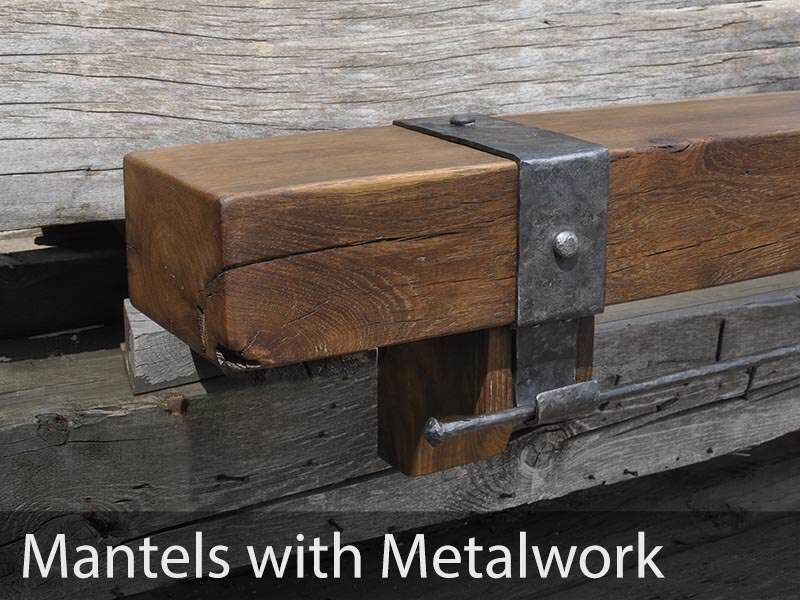 We can add hand-forged fireplace mantel straps and ironwork onto reclaimed beams. Whether it is simple metal straps, a Christmas stocking rod, corbels, or something more elaborate, our blacksmiths are up to the challenge. Using classic old, hammer and anvil techniques, this is the real deal. 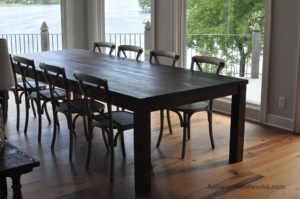 This table design, with two legs and a horizontal stretcher between them, is usually referred to as a trestle table. The basic design dates back to the Middle Ages and was refined in the 16th century. We are very fond of this style for two primary reasons: clean seating anywhere around the table as well as long-term stability and strength. The expression “Farm Tables,” is sort of a loose term. Some people mean only the classic turned leg, thin top plank tables; other people include trestle tables as well. In our case, we’re going to include all legged tables as farm tables. That’s what this collection is all about. 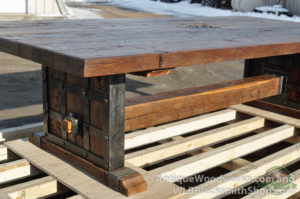 These industrial machine base tables have such a great “cool” factor. I had dreamed of designing tables from old industrial parts over 25 years ago. It was pretty amazing to see our first piece come together. Just like in our wood tops, we seek out a style for our iron that is natural and authentic. As a returning trend, wood countertops are great. With flowing edges, unique colors, and interesting textures, our reclaimed wood countertops are even better than modern solid wood countertops. Hardwood wide planks as well as tongue-and-groove reclaimed wood flooring warms the ambiance of home and give it an authentic, real touch. Plastic, it is not. In our work, we run into old log cabins and barns fairly regularly. When we can, we’d rather see these saved for re-use as cabins and homes. In the cases where the log cabins are already either too cut up, or in severe decay, we reuse the wood for furniture and other projects. This exact beam has been sold. Similar ones may be available. Please contact us.